KINDERHOOK, NY -- The New York National Guard recognized this Hudson River town’s most famous resident Wednesday Dec. 5, on the 224th anniversary of President Martin Van Buren’s birthday. New York Air National Guard Brig Gen. Verle L. Johnston laid a wreath at the 8th president’s grave in the Kinderhook Reformed Cemetery, while a National Guard bugler played taps and a Joint Honor Guard presented arms. 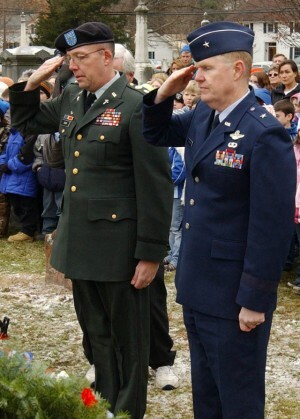 The National Guard traditionally recognizes the birthday of deceased presidents by laying wreaths on their graves. Johnston, the commander of the 105th Airlift Wing, based at Stewart Air National Guard Base in Newburgh, noted Van Buren’s contributions to our nation during brief remarks to an audience of town officials and school children from Martin Van Buren Elementary School. Van Buren was known as “Old Kinderhook”, because of his hometown and marked papers he approved with an “OK,” giving rise to the term. He served as the 8th President from 1837 to 1841. Before his presidency, he served as the country’s 8th vice-President under Andrew Jackson from 1833 to 1837.